Following yesterday’s post where we mentioned Jan doesn’t exist and I’m apparently deceased, a blog comment has been received from Ian asking if he can have Waiouru. Before we can consider this request Ian needs to get here and assist with the sanding! Sanding was something I’ve been doing all day and now understand why people at our stage of life are referred to as “grey power”. We originally thought it referred to the colour of our hair but in my case, after a day of sanding primer, I’m grey all over! Back to the paint preparation. The cabin sides and roof have now been sanded back to a smooth surface. The quantity of small flecks of old paint revealed during the sanding process was quite surprising. Particularly as Waiouru had been grit blasted to remove the original paint! Darren insists all the old paint has to be removed along with the “orange peel” effect in the primer. Despite the sander being connected to a vacuum cleaner, so much primer dust was created it was essential I wear a facemask and ear defenders. The next stage is to sweep down the sanded area before wiping the surface down with ‘tack’ cloths that will collect the last of the dust. The first undercoat can then be applied. No photo as a piebald boat isn’t all that interesting! This morning our Norwegian blog readers handed back their hire boat and then very kindly gave us their unused “provisions” before heading to Reading for the day. They were due to fly back to Norway from Heathrow at 5:00pm. Around mid afternoon they returned by train (standing room only… it was race day at Newbury!) to collect their luggage and wait for the taxi they had ordered. 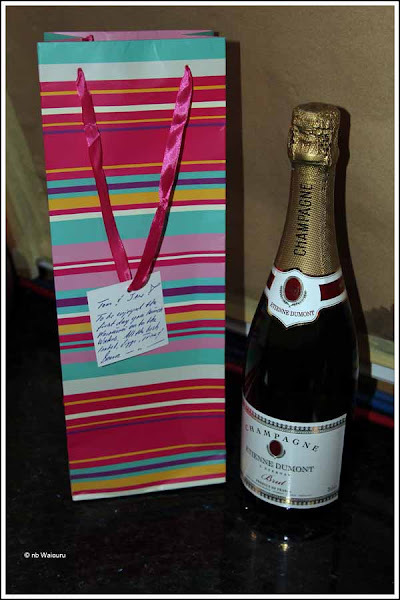 To Jan’s surprise Snorre presented her with a very nice bottle of Champagne to be opened when Waiouru is completed. What a lovely gesture from such wonderful people! We won’t be breaking the ‘bubbly” on the bow…… Such a waste! We will drink it on the day! The flight from the UK to Norway will take them 90 minutes. I’m still trying to get used to European distances. When we lived in Australia the average intercity flight was two hours! Have a safe flight new found friends! Jan interrupted my sanding in the afternoon to tell me it was “beer o’clock” and I should cease sanding. Despite wearing the protective equipment I needed to shower (twice) to remove the grey from crevasses I didn’t know existed. My mouth was a dry as a drovers dog so I down two large glasses of water prior to us departing for the beer garden. If I hadn’t done this I’d have reached the cafe and poured three cold pints of lager down my parched throat in rapid succession. Not only would this have been expense, but Jan would have had to carry me back to Waiouru. Now all that’s left to do is plan tomorrow’s walk! I thought perhaps lighting a candle to honour your memory would suffice!